The Primacoustic SplashGuard™ is a compact stand-mounted gobo that enables the engineer to strategically position the device in between two instruments as a means to reduce splash from one microphone entering the other. Made from durable ABS, the SplashGuard is both light weight and durable. To eliminate reflections from the nearby instrument, the inner side is lined with high density open cell acoustic foam. In use, the SplashGuard mounts on a standard boom stand where it acts like and acoustic shield between instruments and microphones. The innovative design also enables a microphone to be mounted inside the SplashGuard and articulated for optimal mic placement. Once in position, the SplashGuard increases isolation between instruments allowing greater control over each track. This affords the engineer with greater freedom to EQ each instrument. 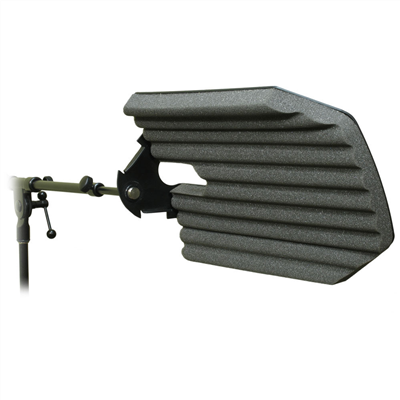 The SplashGuard is easy to use, mounts on any mic stand and is particularly useful in smaller recording studios where space is at a premium.